FLIR offers the Neutrino™ series – a family of high-performance small and light-weight OEM cooled and uncooled camera cores designed for use in a variety of military, surveillance, airborne intelligence, other imaging applications. The Neutrino offers FLIR's common image processing architecture with an excellent resulting image from the 640×512 InSb array. Weighing in at less than 16 oz (<450 gm) and consuming less than 5 watts at steady-state, this balanced MWIR core optimizes performance, cost, and ease of integration. The Neutrino SWaP+C Series, with Neutrino LC and shutterless models, offers a high performance cooled mid-wave infrared (MWIR) core designed for simple integration when SWaP design constraints and performance are needed. 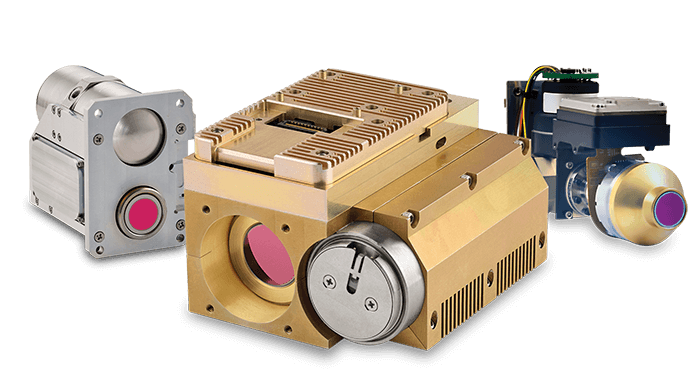 These cameras are FLIR’s smallest and lightest OEM cooled camera cores and incorporate FLIR’s full suite of advanced image processing algorithms such as customizable AGC and Detailed Digital Enhancement (DDE). The Neutrino™ Performance Series includes the FLIR Neutrino QX and SX12. Neutrino SX12 is based on a FLIR 1280×1024/12µ resolution focal plane array (FPA) and has a frame rate of 120HZ 720P and >60Hz for SXGA. Neutrino QX is based on a FLIR 2048×1536/10µ FPA and has a frame rate of 60Hz 1080P and >30Hz QXGA. With these resolutions and frame rates, they are ideal for ground based or airborne Intelligence, Surveillance and Reconnaissance (ISR), counter UAS solutions and Wide Area Motion Imagery (WAMI) applications. For additional information on the Neutrino family, download the available datasheets.